Born in Japan, Yukiko graduated from Oberlin Conservatory where she received a Bachelor of Music with a major in Piano Performance and a minor in Organ Performance. She received a Master of Music in Piano Performance from Boston University. Piano studies were with Victor Rosenbaum, Peter Takacs, Jonathan Shames and Benjamin Pasternack. Piano Pedagogy with Jean Stackhouse; Organ studies with Haskell Thomson and Fenner Douglass at Duke University. Yukiko is a certified Musikgarten teacher and specializes in teaching 18-months to 3 year olds at WCMS. Currently Yukiko teaches piano at her thriving private studio in Winchester. 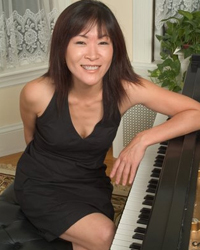 Yukiko performs actively as a freelance pianist / organist and regularly plays with Alea III, a contemporary ensemble group in residence at Boston University.